1 Measure the complete length of the cable C from barrel to the very end of the "S". 2 Now measure the black plastic sheath B including the clips on both ends. 3 Measure the barrel diammeter A. This is across the round face not the length and should be 3.5mm. 4 Subtrack the complete cable length from the black plastic sheath length and this gives you the exposed cable length. This is the most important measurement. Your old cable can be shorter but still have the same exposed cable length as ours. Remember to remove the cable from the handle before measuring. Get a different exposed cable length to what we list? Email us and we should be able to help you out! 1 Measure the outer face of the handle, left to right. 2 Measure the outer face of the handle, top to bottom. 3 This recliner handle measures 90mm x 75mm and takes the 3.5mm barrel. There can be a couple mm tolerances and our trigger will still fit! Recliner handle replacement made easy thanks to CouchGuard®. 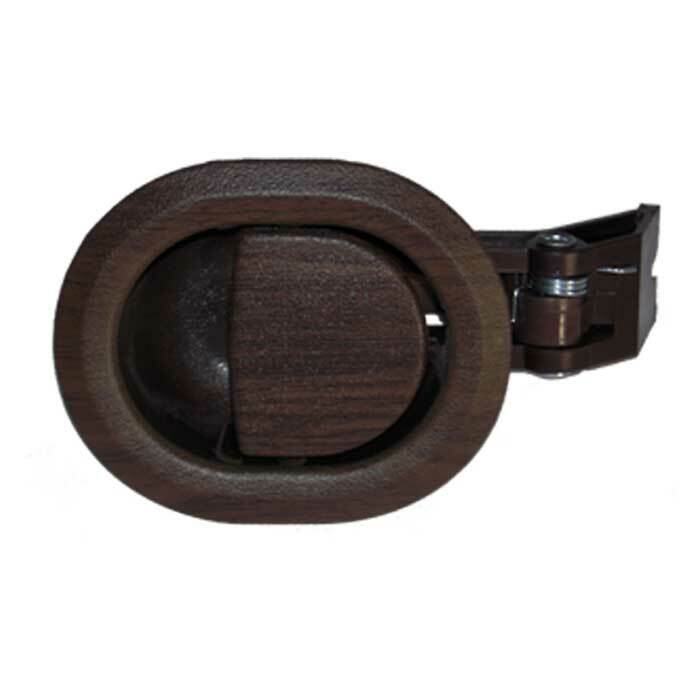 The small brown handle measures 90mm x 75mm across the outer face, takes a 3.5mm barrel and can either be ordered as individual recliner handle or as a complete unit, handle and cable. There exposed cable length is the key to selecting the correct recliner cable. This is easily measured by using the Cable Cheat Sheet that is on this page. Tap or click on the Measuring tab. Once you know your exposed cable length, choose from one of the "Options" in the dropdown menu. I ordered a recliner chair handle and it arrived in just a couple of days. The service was brilliant in all aspects. They even corrected a couple of errors that I had made which resulted in the sale being for less than the original. Much appreciated. Thanks for the good service and it was easy to fit..
1 With the handle already out, locate where the black cable sheath clips into the handle. 2 Remove the wire retaining clip that loops over the cable with a small flate blade screw driver. 3 Unclip the cable from the handle, remove the barrel from the holder and dispose. 4 With the new cable, guide the barrel into the plastic handle barrel holder then clip the plastic sheath clip back into handle. 5 Repalce the wire retainer over the cable and clip one side at a time back into place. 6 Test the new cable for smooth operation before refitting to recliner. 2 Remove the two retaining screws from the trigger release handle. 3 Gently turn the recliner over remember correct lifting methods. 4 Locate the exposed cable end. 5 Manually open the recliner action by levering on the main actuator tube holding the foot rest section not letting it to fling open. 6 Using a pair of pointy noise pliers" clamp the plastic cable retaining clip clips together and remove from the recliner action frame. 7 Locate the "S" end of the cable and remove from the operating pivot. Holding the cable in one hand and the plastic trigger end in the other guide the complete unit out thru the trigger release end opening. 8 Check the new trigger release and cable for correctness before fitting. 9 Feed the new trigger release and cable thru the trigger opening end. 10 With the new plastic trigger release handle sitting in the correct position re-fasten it to the recliner. 11 Attach the "S" end of the cable to the operating pivot, then the plastic retaining clip to the recliner action frame. Test the new trigger release for smooth operation. 12 Gently close the foot rest and turn the recliner back over. 13 Sit in the recliner and open the foot rest using the new trigger release and check for a smooth operation. A. You need to remove the trigger and cable from the recliner, disconnect the cable from the handle and use the Cable Cheat Sheet that is on the website. Q. My handle is brown not woodgrain? Can I get a drifferent shade brown? A. No. Its a woodgrain finish and there is only 1 color woodgrain available worldwide. There is no choice what shade of woodgrain or brown it is. Q. My small handle takes the 6mm barrel? A. We do have some cables with 6mm barrel for the small handles but you would need to measure your cable 1st then email us with your measurements.